The Web Service (WS) Client Application (CA) connects directly to the Payment Express Host WS via HTTPS Posts. Client applications talk to the Web Service using SOAP (Simple Object Access Protocol). SOAP provides a way to communicate between applications running on different operating systems, with different technologies and programming languages. When consuming the web service at the "sec" subdomain (https://sec.paymentexpress.com/WS/PXWS.asmx) please ensure that your web service stack supports lax versioning: that is, it does not throw exceptions for new unknown data members in received data. 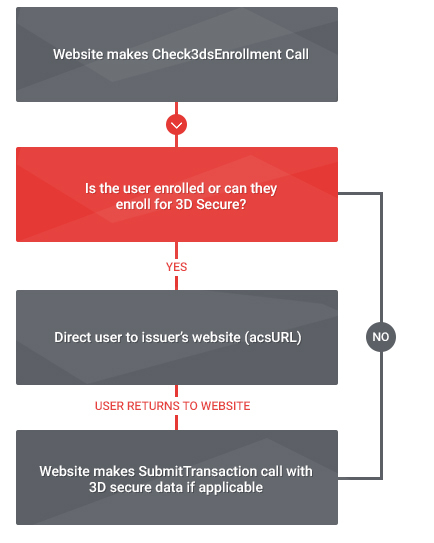 If the merchant's checkout process requires 3D Secure (3DS) integrated in the merchant's web site or application, please go through the 3D Secure with Web Service section. Implementing 3DS in the checkout process allows the liability for fraudulent chargebacks (stolen or counterfeit cards) to shift from the merchant to the card issuer. There is no Web Service installation to do on the client side as this is held at the Payment Express Host. The address to connect to the Web Service is at https://sec.paymentexpress.com/WS/PXWS.asmx for testing please use https://uat.paymentexpress.com/WS/PXWS.asmx. Each method call is self documented at this address by clicking on each method. A Web Services Descriptor Language (WSDL) file is an XML document that describes the arguments accepted by a specific web service as well as the methods and properties supported by that service. The WSDL specification provides the grammar and syntax rules for WSDL files. For the WSDL schema please see https://sec.paymentexpress.com/WS/PXWS.asmx?WSDL. The WS control offers a number of methods to initiate transactions, connect to the Payment Express Server and alter settings and retrieve information. This section details the available SOAP operations and their uses. Add the appropriate XML input fields (Amount, TxnType etc) with the SubmitTransaction SOAP operation to perform a Validate, Purchase, Refund, Auth (Authorisation) or Complete (Completion) transaction. cardHolderName No Card Holder Name as on Card. cardNumber No Credit Card Number. Left justified no embedded spaces or other delimitors. clientType No Allows the Client type to be passed through at transaction time. cvc2 No Card Verification number. This number is found on the back of a credit card in the signature panel - it is different from the embossed card number and provides an additional safety check. cvc2Presence No Indicates information regarding submission of cvc2 value. dateExpiry Yes Expiry date of card in 4 digit MMYY format. Note: do not include "/" or other delimitors. dpsBillingId No The Billing Id generated by Payment Express when adding a card for recurring billing. Needed for rebilling transactions when you do not use your own BillingId. dpsTxnRef Yes Only required for refund or completion transactions. extendedData Optional SOAP XML element to add extended data for ArrayOfNameValueField - see SOAP WSDL for more information. NameValueField Optional SOAP XML element to add in the extendedData element to specify the fieldName and fieldValue. RecurringMode - specifies the card storage reason on tokenisation (storing a card) and rebilling (rebilling card with a token) requests. Further details defined in the Token Billing section. fieldValue Optional SOAP XML element to add the fieldValue for the fieldName in extendedData and NameValueField SOAP XML fields. inputCurrency No Specify the currency here. enablePaxInfo No Used for Airline Reservation Systems. Enable collection of extended booking data to go through to the acquirer if they support it. paxDateDepart No Used for Airline Reservation Systems. Date departing in YYYYMMDD format. PaxDate PaxDate2 PaxDate3 No Used for Airline Reservation Systems. Flight date information. paxName No Used for Airline Reservation Systems. Passenger Name. paxClass3 paxClass4 No Used for Airline Reservation Systems. Class flight information. paxFareBasis3 paxFareBasis4 No Used for Airline Reservation Systems. Fare Basis flight information. paxFlightNumber3 paxFlightNumber4 No Used for Airline Reservation Systems. Flight number information. paxLeg1 paxLeg2 paxLeg3 paxLeg4 No Used for Airline Reservation Systems. Leg 1 flight information. paxStopOverCode3 paxStopOverCode4 No Used for Airline Reservation Systems. Stop over code flight information. paxCarrier No Used for Airline Reservation Systems. 2 character airline identifier. paxOrigin No Used for Airline Reservation Systems. Passenger Origin. paxTravelAgentInfo No Used for Airline Reservation Systems. Travel Agent description field. enableAvsData No2 Address Verification System property. Values are 1 (Enable Verification) 0 (Disable Verification). avsAction No Address Verification System property. Valid values are 0 1 2 & 3.
avsStreetAddress No Address Verification System property. Address that is listed on the customer's bank statement. dateStart No3 The Issue date of the customer's credit card if Issuer requires this field to be present. issueNumber No3 The Issue Number of your credit card if Issuer requires this field to be present. 1 - dpsTxnRef is required for a Refund transaction or Complete transaction only. Must contain the DpsTxnRef returned by the original Purchase or Auth transaction to be refunded or completed. 2 - Feature not supported by all acquirers. 3 - Not required unless card issuer requires it. These Elements are given when the SubmitTransaction method returns results. cardHolderName Card Holder Name as on Card. cardHolderResponseText Response Text of the transaction to help the CardHolder associated with the ReCo. cvc2ResultCode Contains information regarding verification of cvc2. dateSettlement Date transaction will be settled to Bank Account in YYYYMMDD format. This is supported for most but not all banks and card acquirers. If the DateSettlement is not available from the banking network the DateSettlement will contain the current calendar date. dpsBillingId Contains the BillingId generated by Payment Express when adding a card for recurring billing. dpsTxnRef Unique transaction identifier returned for every transaction. Required input for Refund transactions or Complete transactions. reCo 2 character response code. retry If true; retry transaction if false do not retry. statusRequired If true then the result of the transaction could not be determined and you will have to call GetStatus to get the result. txnRef Set by client to uniquely identify transaction. This is used in the same way as SubmitTransaction call, however it also includes the Acquirer response in the result. Refer to the GetStatus operation. The Payment Express architecture does not provide for customer applications to "reverse" or "back out" transactions once started. Exception conditions arise when the link between the customer application and the Payment Express Host is interrupted. A response to a transaction request is not received or the StatusRequired parameter in the response is true. In this circumstance, the result of the transaction is unknown. The transaction must not be assumed to have failed. In this case, the application must enter a "recovery" mode until the result of the transaction can be ascertained. The mechanism to perform this error recovery is easily accomplished using the procedure outlined in the GetStatus method documentation. GetStatus is used when the SubmitTransaction operation fails and the response was not received within a timeout period or the link to Payment Express Server or beyond failed while awaiting a response. In this circumstance, the result of the transaction is indeterminate. The GetStatus operation should be used to retrieve the actual result. GetStatus uses the original TxnRef values which uniquely identify the transaction to lookup the transaction at the Payment Express Host and return the results. txnRef Yes Value assigned to the txnRef property of the transaction to look up. statusRequired If true then the result of the transaction could not be determined and you will have to call GetStatus again. Once the client application has confirmed the result of the transaction with the Payment Express Server with the GetStatus call, normal processing of subsequent transactions using SubmitTransaction method can resume. Ensure that this txnRef value is loaded in txnRef property before calling GetStatus. Payment Express Host maintains transaction results for at least 48 hours therefore calls to GetStatus can rely on results being available for at least this period following transmission of the original transaction. If a GetStatus method is made for a transaction that was successfully processed by Payment Express Host and was accepted by the bank, then the GetStatus method will result in the Web Service properties being set exactly as they would have been for the original transaction result, regardless of whether the original transaction result was actually received by the client application. This is used in the same way as GetStatus call, however it also includes the Acquirer response in the result. UpdateCard call is used to update the expiry date of a BillingId, DpsBillingId or CardNumber2 associated with a credit card. This is useful when a customer's credit card has expired and they receive a new one from their bank with the same credit card number. cardDetails Yes An escaped XML document containing dateExpiry and BillingId DpsBillingId or CardNumber2. UpdateCardResult An escaped XML document indicating the outcome of the operation. The input SOAP message contains an element named cardDetails. The cardDetails string value should be an XML document which has be escaped before submission. dateExpiry and either billingId, dpsBillingId or cardNumber2 must be supplied. The output SOAP message contains a single element named updateCardResult. The updateCardResult string value contains escaped XML which must be unescaped in order to parse the values. The updateSucceeded value indicates the success of the update and the reco and responseText values provide further details. Payment Express supports Authorisation and Complete transaction types. An Auth transaction verifies that funds are available for the requested card and amount, and reserves the specified amount. A Complete transaction is sent at a later date to cause funds transfer for the previously authorised amount, or a smaller amount if the total original value is no longer required. This transaction set is useful when the merchant needs to ensure that funds up to a certain limit are available but the actual total amount is not yet known or goods or services have not yet been delivered. Use the SubmitTransaction operation with TxnType set to "Auth" for the amount to be authorised. The Auth response contains a DpsTxnRef. The funds are not transferred from the cardholder account. After a successful Auth transaction, but within 7 days maximum, a Complete transaction must be sent containing theDpsTxnRef returned by the Auth transaction. A setup phase involves loading a card into Payment Express. Optionally the setup phase can include an online $0.00 Validate (only a validation of card transaction - no funds held) or $1.00 Authorisation (Auth) transaction which will determine that the card is valid and not on hot or stolen card lists and that it has the correct expiry date. Customers will typically integrate directly into their call centre or web application for the setup phase. TxnType property set to "Purchase" or "Auth" or "Validate"
Note: The RecurringMode string value should be set based on the merchant’s business case for tokenising. The merchant application or Batch processor requests a new transaction and supplies the appropriate DpsBillingId or CardNumber2 or BillingId, RecurringMode (mandatory), a MerchantReference which appears on reports and the amount to be charged. EnableAddBillCard value will be set to 0 (False) for the rebill phase. Payment Express retrieves the credit card number and expiry date stored in the Setup Phase and a purchase transaction is formatted and processed to the card acquirer. Note: The RecurringMode string value should be set based on the merchant’s business case for token rebilling. Note: CardNumber2 functionality is only available via SOAP Requests made to the subdomain "sec". CardNumber2 is a token generated by Payment Express and associated with the card details supplied. It has 16 numeric characters and conforms to a Luhn "mod 10" algorithm. This makes it ideal for storage within the database in place of a card number where the value is validated against checks which might normally be made against credit card numbers. A CardNumber2 value is always unique for a given card number and includes a card type indicator. Should a card number be presented for tokenization multiple times the same CardNumber2 value will be returned. CardNumber2 tokens are generated for all transactions once enabled by Payment Express (please contact your Payment Express account manager to discuss).The token will be returned in the "cardNumber2" property of the transaction response "TransactionResult2". Charging a CardNumber2 token involves a request from the merchant application or Batch processor including an appropriate cardNumber2, a TxnType (Purchase) and the amount to be charged (an optional MerchantReference can be added for reporting purposes). EnableAddBillCard value will need to be set to "False" (or 0) for the rebill phase. Payment Express retrieves the credit card number and expiry date stored in the Setup Phase and a purchase transaction is formatted and processed to the card acquirer. CardNumber2 transactions use the card expiry date stored with the token regardless of whether one is passed through in the transaction data. On a successful transaction with the real card number associated with a CardNumber2 token the expiry date stored with this token will be updated to that which was used to process the transaction. If your client application displays details of stored tokens to cardholders eg: masked number and expiry date, then it is advisable upon a successful transaction for the merchant application to update the expiry date that is stored with the generated token. The Web Service is capable of handling Refund (credit) transactions. A Refund transaction will credit the transaction amount back to the cardholder’s account. It has to be supported by the merchant’s bank or acquirer. To process a Refund transaction, please match the original Purchase or Complete transaction with a DpsTxnRef. The original transaction reference may have been processed by other Payment Express gateway interfaces. Hence please request the Web Service gateway account to be under the same Group as the other gateway accounts where the original transaction may be processed from. Please send the DpsTxnRef value as a reference that was provided from the response of the original Purchase or Complete transaction. Multiple refund transactions can be processed to the maximum amount of the original matched transaction. The TxnType is set to Refund. The Payment Manager (Payline, provided to all merchants by default) allows merchants to request Refund transactions manually via our portal. The Web Service is capable of handling Void (advice) transaction requests. A Void transaction will cancel or reverse the original transaction. It has to be supported by the merchant’s bank or acquirer. To process a Void transaction, please match the original Purchase, Auth or Refund transaction with a DpsTxnRef. The original transaction reference may have been processed by other Payment Express gateway interfaces. Hence please request the Web Service gateway account to be under the same Group as the other gateway accounts where the original transaction may be processed from. Please send the DpsTxnRef value as a reference provided from the response of the original Purchase, Auth or Refund transaction. Normally a Void transaction can be useful to reverse an Auth transaction in order to release the funds held on the cardholder’s account (normally within 7 days maximum). The TxnType is set to Void. The Payment Manager (Payline, provided to all merchants by default) allows merchants to request Void transactions manually via our portal. The Web Service is capable of taking extended booking information, which is used to display on cardholders statements. PaxDateDepart = "14122008" PaxName = "Brian Smith" PaxOrigin = "AKL" PaxLeg1 = "SYD" PaxLeg2 = "LAX" PaxLeg3 = "LHR" PaxLeg4 = "AKL" PaxTicketNumber = "0030458343" PaxCarrier = "QB" PaxTravelAgentInfo = "BA1234567890"
The following section provides a detailed description of each Web Service element and indicates if it used as an input or output. If a property is marked as input, it is not updated or output when a call to SubmitTransaction or GetStatus returns. This is important when a call is made to GetStatus for example, the original contents of Amount as input to the SubmitTransaction call are not output by GetStatus. Total Purchase, Refund, Auth or Complete amount. Format is d.cc where d is dollar amount (no currency indicator) and cc is cents amount. for example, $1.80 (one dollar and eighty cents) is represented as "1.80", not "1.8". A string value is used rather than the conventional Currency Datatype to allow for easy integration with Web applications. Note that the original value used as input to SubmitTransaction is not returned by any subsequent DoGetStatus and must be stored by the application if required. Maximum value allowable is $99,999.99. Note that acquirer or card limits may be lower than this amount. When submitting transactions for currencies with no decimal division of units such as JPY the AmountInput must be in an appropriate format e.g. "10". Authorization code returned for approved transactions. More detailed explanation of result. Intended for card holder. The cardholder name as it appears on customer card. Optional and may be left blank. Brief (Max 32 character) response text intended for card holder. The card number. No leading or embedded blanks are permitted. Must contain a numeric value. Not required for Complete or Refund TxnType. A Billing Token value formatted to resemble a card number and pass a Luhn check. To use CardNumber2 tokens your account must be configured to generate them. Please contact our support team if you intend to use this feature. The card type used for the transaction. Note that the list may be expanded as support for new cards is added. The CardName format is to capitalize the first letter with remaining letters in lowercase. 2 - Card holder has stated CVC is illegible. 9 - Card holder has stated CVC is not on the card. Recurring -if supported by your merchant bank expiry date will not be validated. Indicates card expiry date. Format is MMYY where MM is month 01-12 and Year 00-99. do not insert "/" or other delimiter. Not required for Complete or Refund transactions. Indicates Date of settlement (when money will be deposited in Merchant bank account) if this is supported by the Acquirer, otherwise contains the date the transaction was processed in YYYYMMDD format. The Issue date of the customer's credit card, if Issuer requires this field to be present. Format is MMYY where MM is month 01-12 and Year 00-99. do not insert "/" or other delimiter. The Issue Number of your credit card if Issuer requires this field to be present. The Country code for the country the credit card used was issued in. Address Verification System property. Values are 1 (Enable Verification), 0 (Disable Verification). Your bank may require that you use AVS, in which case you will need to set to 1. Address Verification System property. Post Code that is listed on the customer's bank statement. Address Verification System property. Address that is listed on the customer's bank statement. Address Verification System property. Valid values are 0 - 4 as described below. 0 - do not check AVS details with acquirer, but pass them through to Payment Express only. 1 - Attempt AVS check. If the acquirer doesn't support AVS or AVS is unavailable, then the transaction will proceed as normal. If AVS is supported and the AVS check fails, then the transaction will be declined. 2 - The same as 1 except the transaction must be checked by AVS. If AVS isn't available, the transaction will be declined. 3 - AVS check will be attempted and any outcome will be recorded, but ignored i.e. transaction will not be declined if AVS fails or unavailable. 4 - Attempt AVS check. If the acquirer doesn't support AVS or AVS is unavailable, then the transaction will proceed as normal. If AVS is supported and the AVS check fails with a response of “N” (address and postcode both do NOT match what issuer has on file), then the transaction will be declined. Partial AVS matches such as postal code only matches or address only matches will be accepted. The value will most likely be 1 for most circumstances. Returned for a successful billing transaction if EnableAddBillCard is set. Supplied as input to rebill a transaction if BillingId is not used. It is not allowed to specify both a BillingId and a DpsBillingId when rebilling a transaction. Returned for every transaction. If the transaction was approved, DpsTxnRef can be used as input to a Refund transaction. Used to specify a transaction for refund without supplying the original card number and expiry date. If set to true on input to SubmitTransaction, the details necessary to charge the same customer in the future are securely stored. A BillingId may optionally be attached on input. DpsBillingId is returned. See Token Billing section for details on using this feature. Free Text Field for use by merchant (could be order number, customer number etc.). Used for Airline Reservation Systems. Enable collection of extended booking data to go through to the acquirer. Value will need to be true (1) if ticket information is included with the transaction. Used for Airline Reservation Systems. Date departing in YYYYMMDD format. Numeric. Used for Airline Reservation Systems. Carrier flight information. Alphanumeric. Used for Airline Reservation Systems. Leg depart date flight information. Alphanumeric. Used for Airline Reservation Systems. Leg depart time flight information. Alphanumeric. Used for Airline Reservation Systems. Class flight information. Alphanumeric. Used for Airline Reservation Systems. Stop over code flight information. Alphanumeric. Used for Airline Reservation Systems. Fare basis flight information. Alphanumeric. Used for Airline Reservation Systems. Flight number information. Alphanumeric. Used for Airline Reservation Systems. Passenger Name. Alphanumeric. Used for Airline Reservation Systems. Passenger Origin of departure. Alphanumeric. Used for Airline Reservation Systems. Passenger Ticket Number. Format: AAATTTTTTTTTTC. AAA is airline code, TTTTTTTTTT (10 chars) is actual ticket number and C is check digit. Numeric. Used for Airline Reservation Systems. Travel Agent description field. Also known as the Booking Reference on some of Payment Express screens. Alphanumeric free text field. Used with PostUsername to determine account for settlement. Payment Express clients can be set up with more than one bank account. Each transaction may be designated for a specific account if required. Used with PostPassword to determine account for settlement. Payment Express clients can be set up with more than one bank account. Each transaction may be designated for a specific account if required. Response Code generated by Payment Express Server (for locally declined transactions) or by the Card Acquirer (for host originated responses). The ReCo should not be checked by the client application, as these values differ based on the acquirer. Use the Success property to determine the result of a transaction. Refer to the Response Codes section for a list of valid response code errors generated by Payment Express. If true, then the transaction should be sent again - the transaction was declined due to a temporary error. If false, then the transaction should not be sent again, regardless of whether it was accepted or declined. The transaction result returned was not directly influenced by the card details supplied or the standing of the cardholder's account with the card issuer. Rather, the transaction result can be attributed to a transient state. Payment Express recommend that, if possible, the merchant resubmit the transaction within reasonable frequencies given that the duration of the state affecting transactions is unknown. If transactions are being repeatedly rejected in excess of that expected to be handled by the application these should be raised for manual intervention and the Payment Express support team contacted by the merchant. If true then the status of the transaction could not be determined, either because the server could not be reached, because of an error, or because the transaction is still in progress. Your application should call GetStatus until StatusRequired is false (0). Optional free text fields. Usually assigned at origin website. An identifier provided by your application to uniquely identify the transaction. This is the TxnRef supplied by the client to initiate the transaction, or, if not supplied, a TxnRef value internally generated by Payment Express on return. This is required as an input for GetStatus operations. Auth Authorise - amount is authorised no funds transferred. Complete Complete a previous authorisation - funds are transferred. Purchase Purchase - Funds are transferred immediately. Refund Refund - Funds transferred immediately. Must be enabled as a special option. Validate Validation transaction. On the amount 0.00 or 1.00 validates card details including expiry date. Often utilised with the EnableAddBillCard property set to 1 to automatically generate a card's token for rebilling. Note that the Validate transaction type may not be enabled by default on live accounts. Please make a request to Payment Express Support if you would like to utilise this transaction type. The client application should not interpret the ReCo (Response Code) property contents - it is to be used for REFERENCE PURPOSES only. The Authorized property should be used to determine the outcome of a transaction. 00-99 Numerical Response Codes are generally returned by the card issuing bank. These values and descriptions are confidential and usually vary from bank to bank. The 3D Secure (3DS) Web Service allows merchants to accept credit card details within their own interface whilst allowing them to authenticate the user via the 3D secure system. The merchant website utilises Payment Express Merchant Plug-In (MPI) through functionality exposed by way of a SOAP Web Service. This section covers integration of the 3D secure system in the Payment Express Web Service interface. In order to test the web service a merchant will require a merchant account configured and enabled for 3D secure transactions. The merchant website POSTs user's browser to the issuer's website (acsURL). POSTed data includes the PaReq received in step 4 above, the URL to which the user should return once authentication has taken place, and an optional property that can be used to help identify the when they return to the website. Below is an example of a form containing all of the necessary input values and the optional 'MD' property. 8. The user is directed back to the URL specified in the TermUrl input parameter by way of client-side POST. POSTed data includes a value named "PaRes" and "MD" will be returned if supplied in step 6. Please note the PaRes value’s length should generally be much longer than the PaReq value which was returned from the Check3dsEnrollment request. If the PaRes value is shorter in length than the PaReq you may receive a declined transaction response in step 9. 9. Post the SubmitTransaction (operation details provided below) SOAP request, if applicable, with the paRes value (received from step 8). Enter the paRes value only if received the valid enrolled flag and paReq in step 4, otherwise leave it empty. The response from the SubmitTransaction request should be recorded in the merchant server or system for reporting any issues to Payment Express. 2 The card is not enrolled for 3D secure however the user can be given the opportunity to do so. dateStart The Issue date of the customer's credit card if Issuer requires this field to be present. issueNumber The Issue Number of the credit card if Issuer requires this field to be present. enableAvsData Address Verification System property. Values are 1 (Enable Verification) 0 (Disable Verification). avsAction Address Verification System property. Valid values are 0 1 2 & 3.
avsStreetAddress Address Verification System property. Address that is listed on the customer's bank statement. cardHolderResponseText Response Text of the transaction to help the card holder associated with the ReCo. The 3D secure web service allows merchants to accept credit card details within their own interface whilst allowing them to authenticate the user via the 3D secure system. The merchant website utilises Payment Express merchant plug-in (MPI) through functionality exposed by way of a SOAP web service.